Riverside Farm provides the setting for a perfect Vermont Farm Wedding. The authentic, fully functioning farm is one of the most coveted venues in the New England area. 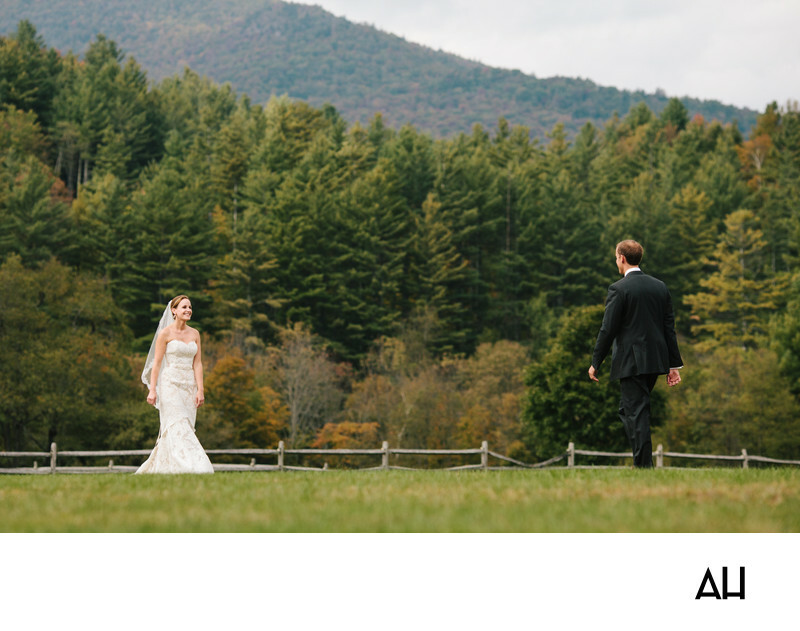 The above picture shows the bride and groom of a Riverside Vermont Farm Wedding walking toward one another in a grassy green field. The couple had spent the morning apart in separate cottages that are provided by Riverside Farm. The Groom’s Cottage is a rustic cabin, and the Bride’s Cottage is a quaint, little red home. The two prepared for the day in their respective spaces and did not see one another until this moment of their first look. The bride is stunning in ivory and white lace, highlighted by the green and fall hues around her. The scene is filled with wide open sky, fresh air, and mountains that tower in the background covered in fall foliage. The changing of the seasons is exceptionally beautiful in this area of the country, with so much space left untouched by humans and views for miles. The setting of this first look is picturesque, and will provide a photo memory that the couple can cherish forever. In the photo the bride’s gown is breath-taking, with a traditional sheer and lace veil flowing from her hair down her back as she walks toward her love. The groom’s face is turned toward the bride and can not be seen in the picture, but it is still obvious that he is smiling just as broadly as she is. This day is for them, a celebration of their relationship and the journey that has lead them to this moment. This instant is symbolic in a way of the steps the couple have taken to come to this day, the day that they become husband and wife.